If you’re feeling spring, a touch of lemony zing will be just the thing! Give Jamie Oliver’s delectable trout a try and make sure to pay special heed to his sustainable instructions. When shopping for ingredients, keep in mind that land-based farmed Rainbow Trout from Canada and the U.S. is your best SeaChoice. Preheat your grill to full whack. Slash each trout with a knife, about ten times on each side. Each slash should be about 0.5cm/¼ inch deep. Rub the trout with olive oil and season with salt and pepper. Stuff the cavities with plenty of chopped parsley and the lemon slices. 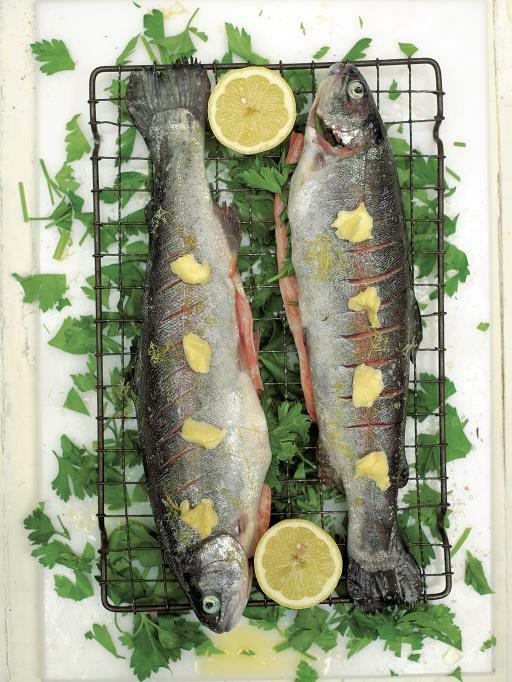 Place the fish side by side on a baking rack over a roasting tray. Put the lemon zest on top of the fish and place the lemon halves on the tray too. Dot the trout with the butter and place it 15cm/6 inches from the grill. Cook for around 6 minutes on each side until crispy and golden. Squeeze the roasted lemon over the top of the fish and serve with a simple crunchy side salad.